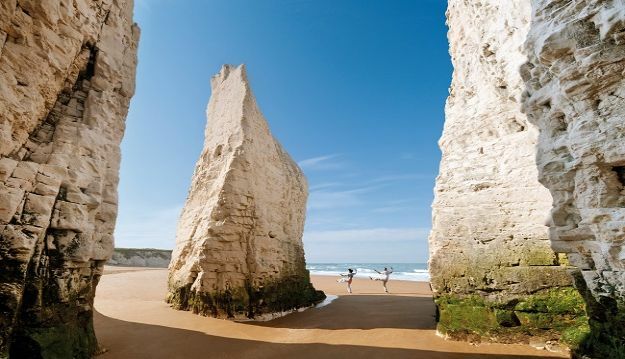 The seaside resorts of Margate, Broadstairs and Ramsgate, situated on the north-eastern coast of Kent deliver great-value, quality attractions and first-class facilities. All are easily reached from London and mainland Europe via good road, rail and ferry services. 2015 sees the opening of Dreamland, “the UK’s original Pleasure Park” with historic rides, classic side shows, eateries and evocative spaces, set within a landscape capable of hosting national festivals and major events. Take a step back in time to discover what life was like in a network of underground tunnels, home to 1000s of people during WWII at the Ramsgate Tunnels. The area is rich in history and heritage with strong links to great names. Charles Dickens loved to holiday in Broadstairs and described it as ‘Our English watering place’. The author is celebrated with the annual June Broadstairs Dickens Festival. Augustus Pugin, designer of the interiors of the Houses of Parliament, lived here in the house he designed ‘The Grange’. Open days are held throughout the year and next door St Augustine’s church is home to the family vault. The internationally acclaimed Turner Contemporary in Margate is named after the famous artist JMW Turner, who frequently visited the town and described the skies here as ‘the loveliest in Europe’. 2015 exhibitions at the gallery include ‘Self – featuring Van Dyck’s last self-portrait’, ‘Carlos Amorales’ and ‘Grayson Perry’. For all big and little kids Hornby Visitor Centre, at the global headquarters of Hornby, features fascinating displays about some of the nation’s best loved toys; Horny, Scalextric, Airfix and Corgi. An entertaining and busy calendar of events across Margate, Broadstairs and Ramsgate provide year round entertainment – art exhibitions, music festivals, food and drink fairs, sporting events and heritage open days.